the world fallen under this falling. sending a cold shower down on us both. a sympathizer with the anarchic cause of snow. and -- clap your hands -- the Peanuts Play School. all but the few girls whispering by the fence. which small queen is about to be brought down. We take great care to keep your personal information secure. As part of these ongoing efforts, we are notifying you that the computer you use for online bill payment may have been exposed to software that puts the security of your computer's contents at risk. This letter will help you determine if your computer is actually infected and advise you how to fix the problem and protect yourself against future risk. * After reaching the blank screen, your computer's virus protection program did not tell you via pop-up or other messaging that malicious software was detected and quarantined. If all four of the conditions above are true, your computer may be infected. We have partnered with McAfee®, the world's largest dedicated security technology company, to provide you with a complimentary copy of its VirusScan® Plus software which, when installed, will detect, block and remove any malicious software from your computer hard drive. Please contact us at 877-800-4864 for further instructions or 800-564-9184 (Option 1) for further instructions. We will also offer you both advice and free services that can help you mitigate any risk you may face as a result of this incident or other everyday exposures you may encounter. CheckFree will never ask for your password via email or via phone. If you ever receive an email requesting your password, do not respond and delete the email immediately. We value your business and your trust, and we apologize for any inconvenience this incident has caused. Another bit of Plague of Spells novel promotion, this time in the form of a fragment of the narrative turned into a D&D encounter you can add to your game! In this scene, Raidon Kane comes upon the city of Starmantle, but finds it has changed much since his last visit . . .
atonal melody that clawed at sanity. If you're a subscriber to DDi (and Dragon and Dungeon magazine), download the PDF. If you're not a subscriber . . . I apologize. As the author, I'd hoped to make this a purely promotional piece for Plague of Spells, but Dungeon saw it as premium content that its subscribers should have the benefit of, which I understand. So, if you really want to see this scene of the book come alive as a D&D encounter, consider it another reason to take the plunge and subscribe to DDi. For a taste, download the free first chapter here. If you'd like to talk about the book, you can do so in the comments here, in the comments at plagueofspells.com, or on other online forums I'll find links for. Reviews are pending, but please provide your own, I'd love to hear it! 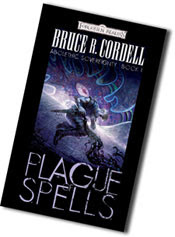 Download a free copy of the first chapter of Plague of Spells here! If you want, you can also read my answers to several interview questions regarding the novel.